A potent antioxidant, selenium helps protect cells against damage from free radicals– unstable molecules associated with the aging process. Selenium is a trace essential mineral that is critical to the biological processes that support and maintain your overall health and well being, including immune response. Research continues to expand and define its multiple biological roles in human and animal nutrition. Selenium is absorbed by plants from the soil and enters the human diet through a variety of edible crops. When those crops are eaten, selenium is absorbed into body tissues and is incorporated into protein as a replacement for sulfur. The resulting selenoproteins are critical providers of cellular component protection against oxidation and free radical damage. Selenium may also reduce the risk of certain cancers. If you live in a region where the earth contains inadequate levels of Selenium, you could suffer from selenium deficiency. Even in areas where the soil contains adequate levels, you still may or may not be getting enough selenium from your diet. Since Selenium levels in the body are so critical to overall health, supplementation is not only a potentially wise choice but could soon become recognized as a dietary requirement. In our review of the current literature, the case for selenium supplementation is both real and immediate. Although Selenium is available as an inorganic salt (sodium selenite and sodium selenate), the inorganic forms are significantly less bioavailable and cannot be stored in significant amounts in body proteins. The preferred organic form is L(+)-selenomethionine which is the predominate source in major staple foods. It is readily absorbed and can be directly incorporated into body proteins in place of methionine. 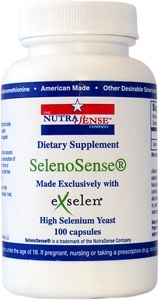 Supplemental selenomethionine is available in both a pure form and as Selenium Yeast. The former is both expensive and less robust with respect to other trace organic-selenium compounds that are present in Selenium yeast and believed to have additional nutritional benefit. Please note that there are no live yeast cells in selenium yeast and that selenium yeast has been used as the preferred selenium source in a number of human clinical trials. Suggested Dosage: Adults take one capsule daily or as directed by your health care professional. Caution: Not for use by persons under the age of 18. If pregnant, nursing or taking a prescription drug, consult with your health care practitioner prior to use. Keep out of the reach of Children. Protect from heat, light and moisture. Store at 15-30°C (59-86°F). If I could only take 3 or 4 things, this would be one of them. This is the same selenium formulation found in expensive products (selenium is very important for a healthy immune system). If you don't like to eat Brazil nuts, this is your formulation.